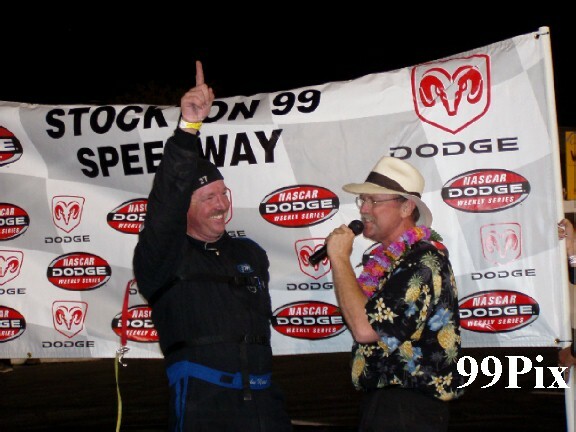 STOCKTON 99 SPEEDWAY, SATURDAY, AUG. 21 -- Granite Bay’s #27, John Moore earned his first DODGE Weekly Series NASCAR Western Late Model main event win of this season. “It’s been a long time coming, I thought I’d burn some rubber,” said Moore from the winners circle after he had entertained the crowd with a few celebratory, smoking 360’s. 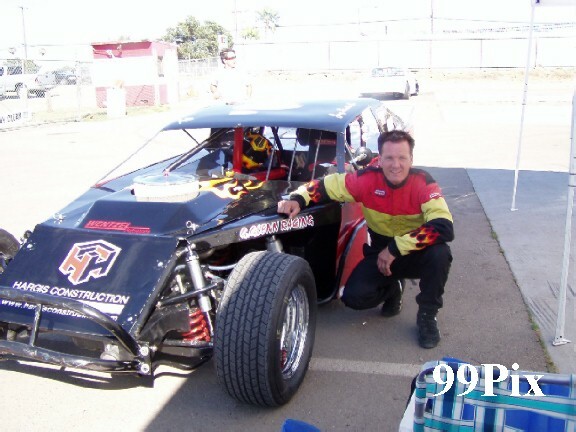 Rookie Gary Shafer Jr., #96, of Stockton, and Manteca’s #61, Guy Guibor started at the pole and outside pole positions. 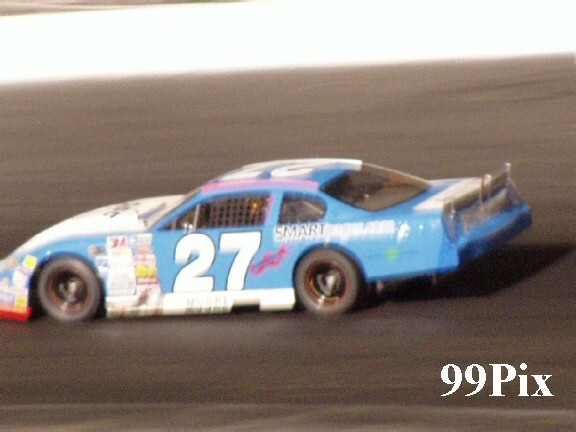 Shafer Jr. took a quick lead on the backstretch, but by lap-3 Stockton’s Pete Anderson Jr. jumped into first. Just after Anderson Jr. nabbed the front slot the race’s first caution flag flew. Following the restart Anderson Jr. and Guibor sparred for first, with Anderson Jr. eventually taking it. By lap-5 Anderson Jr. had strengthened his lead. It was about then that Pacific Grove’s Dave Byrd, the current division points leader, had worked his way from a four-deep start to the third position. 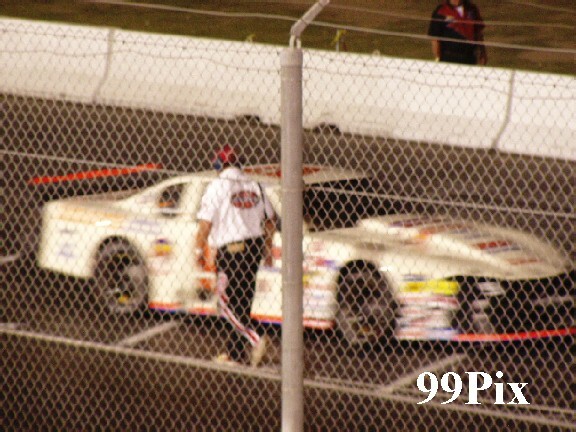 Then, on lap-8, Stockton’s Dwight Pilcher drew a caution when he spun out on the backstretch. 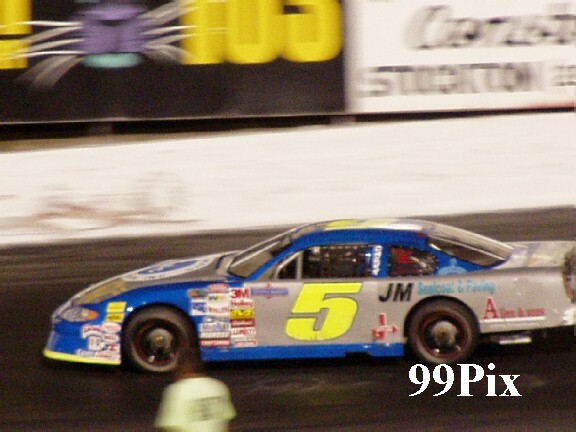 The restart pitted #5, Anderson Jr. and Guibor up front, with Moore and Byrd just behind. By lap-9 Anderson Jr. held the lead, Moore was at second and Byrd was holding strong at third, but looking for an inside track to take Moore’s second place position, he couldn’t find it, and the racers held fast. In lap-22 things started to change. Another caution waved. At the restart Anderson Jr. and Moore were up front, with Byrd and Guibor trailing. Anderson Jr. quickly took the lead and Moore dropped to second. On lap-24 Byrd passed Moore and took the second place slot. On lap-25 Byrd made his play for first on the backstretch, only it didn’t work out as he had planned, he ended up clipping Anderson Jr., sending him into the infield and drawing a caution. At the restart Byrd and Anderson Jr. were sent to the back of the pack. Moore and Guibor held the pole and inside pole. Both battled for first for a couple of laps, but Moore eventually took the lead and held it through to the checkered. Stockton rookie Joey Stearns took second, Guibor took third, rookie Eric Humphries, of Chowchilla, earned fourth and Anderson Jr. ended at fifth. Fans looking for plenty of Pure Stock action found it Saturday night on the fastest NASCAR quarter-mile oval west of the Mississippi! In addition to the 30-lap main event, they were also treated to a B-main, four heats, a dash and a door-to-door. 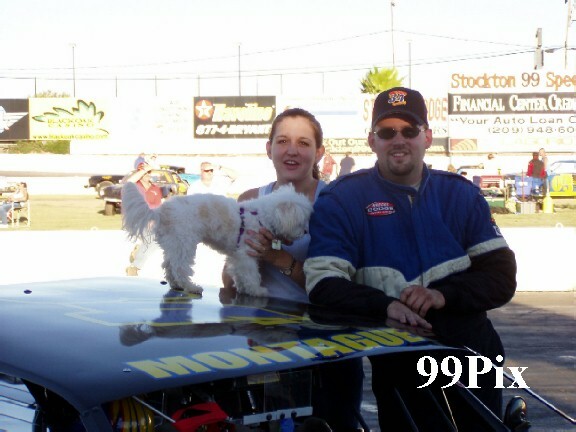 Modesto’s Charlie Clawson won the 30-lap main and his teammate Ken “The Rat” Ratcliff took second. The win marked Clawson’s sixth of the season. Clawson started the race three-deep on the outside. Stockton’s Leroy Hunt and Jim Vosberg were up front. Vosberg quickly slipped into the lead and Clawson made a fast move to capture third. The drivers didn’t even make it one lap when the first caution flag flew. At the restart Vosberg had the pole, hunt had the outside pole and Clawson and Ratcliff were just behind. Clawson quickly jumped into second, began pushing Vosberg hard and by lap-4 he had captured the lead -- he held it through a few more caution flags to take the checkered flag. 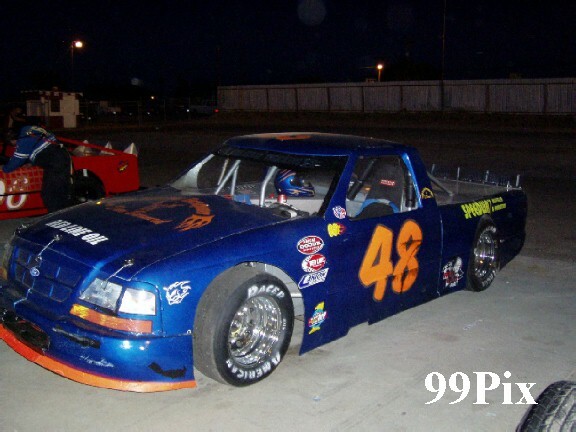 Before any of the races began, Clawson, with a 327 cubic inch engine under the hood, recaptured the Pure Stock qualifying time record for the third time this season. Clawson, who suffered a disqualification several weeks ago when it was found that his motor was a few too many cubic inches big, went to the smaller engine and had some bad luck for several weeks following. After the win he said that he has kept the 327 under the hood, and that after some work on the suspension the car is running its best. Stockton’s Harper took third, Manteca’s Michael Brooks Jr. finished fourth and Galt’s John Medina ended at fifth. 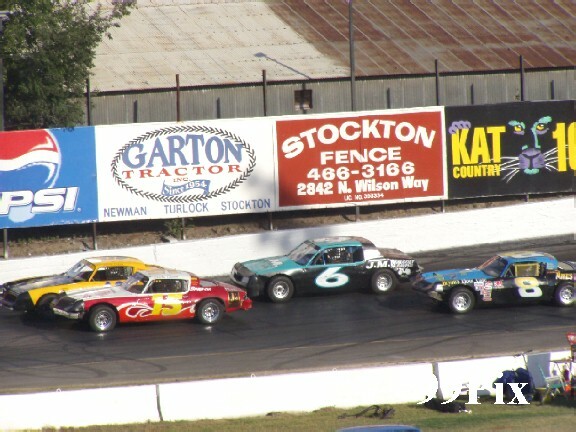 Newark’s Ted Montague IV captured his fourth win at Stockton 99 Speedway’s quarter-mile NASCAR oval. 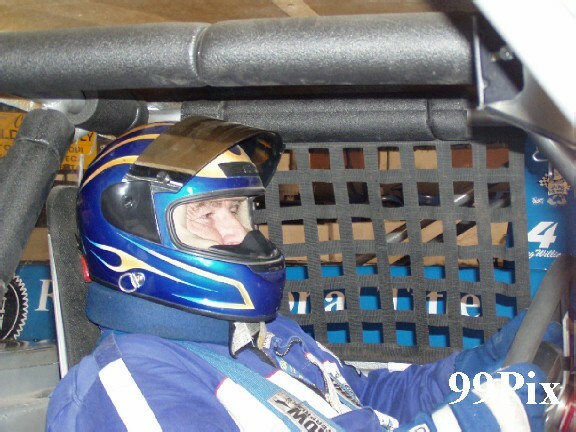 “Keeping the car going after the spinout” was the key to the win, according to Montague IV. The spinout Montague IV referred to happened late in the race. In lap-24 Montague IV took the lead from Citrus Heights’ Jay Linstroth with a risky outside move on the homestretch. The cars contacted and a spinout ensued. The restart pitted Monatgue IV and Linstroth at pole and outside pole. Monatgue IV slipped into the lead and held it through the checkered flag. Linstroth took second, Modesto’s Mike Beeler took third, Stockton’s Joe Allen earned fourth and Lockeford’s Butch Basto finished fifth. 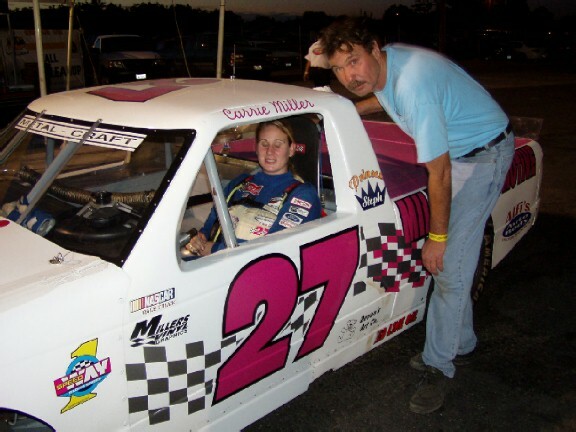 Stockton’s Paul Murarik started at the pole, points leader #27, Carrie Miller, of Saratoga, started three-deep. 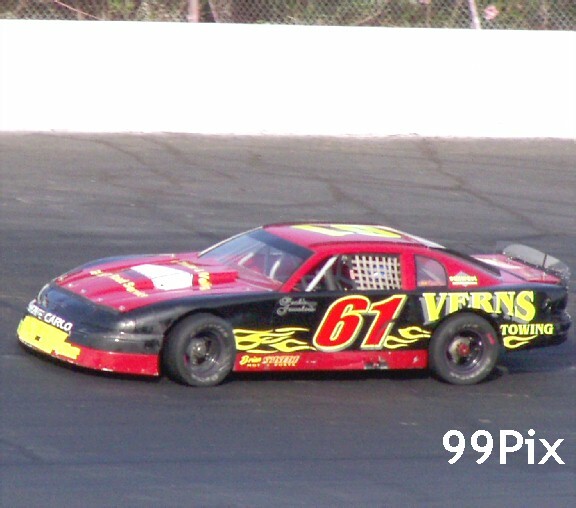 Lodi’s #48, Mike Curry grabbed a quick lead on lap-1 and held it through the to the end. Curry had some challenge from Lodi’s Danny Basto and Miller, but in the end he could not be caught. Despite her third place finish and the close points race, Miller retained her lead position in the division points race. The season is coming to a close and there are three big events planned for Stockton 99 Speedway’s Autumn Nights of September. Saturday, Sept. 4: Western Late Model drivers will run the third leg of the HAVOLINE/C.L. BRYANT 100-lap Tri-Holiday classic. There is a close points battle between the Tri-Holiday’s top three: Stockton’s Danny Contessottto (93), Turlock’s Chris Monez (90) and Byrd (83). Pure Stock drivers will have a double points night that could change points standings. USAC Western States Sprint Cars will race and the BCRA will hold its MIDGET title race. 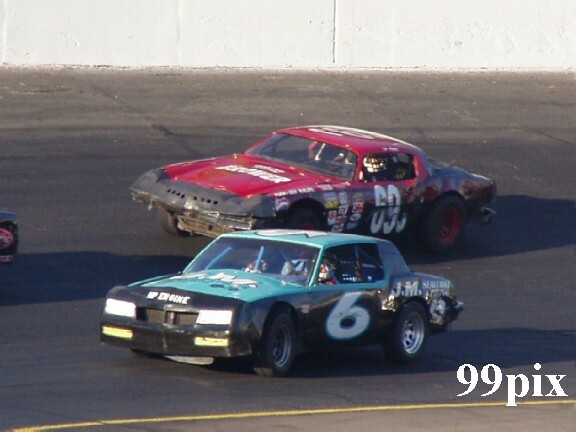 As an added bonus, Miniature Motorsports Racing Association’s 8-to-16-year-old drivers will race in miniature replica Nextel cup cars. Saturday, Sept 18: The HAVOLINE/C.L. BRYANT/DODGE Grand Season Finale featuring a Giant School Bus Destruction Derby, the Annual Powder Puff Race and the last double points night for Western Late Model, Grand American Modified and Pro-4 Trucks. Saturday, Sept 25: The HAVOLINE/C.L. BRYANT second Annual Western States Open Comp 100-lap Race for late model stock cars feature event. 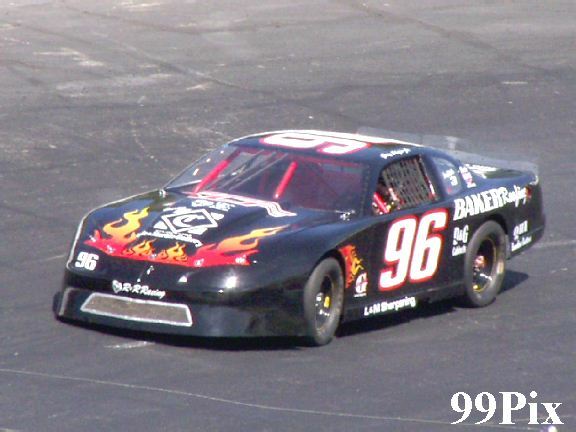 And, Grand American Modified and Pure Stocks.